I was looking at the third estimate for the fourth quarter 2014 GDP by BEA when I decided to take a gander at the GDPNow forecast for this quarter. Yuck! It reminds me of the first quarter of 2014 which started out modestly positive and quickly went negative when the BEA estimates for health care spending were too high. Here is the 2015 GDPNow chart. It should be interesting to see what the health care spending contribution is for the first quarter in 2015. 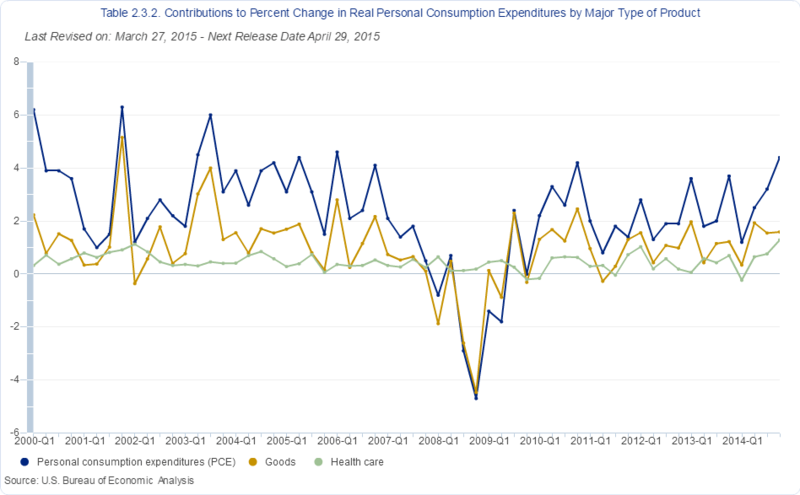 In the fourth quarter of 2014 the percent change in Personal consumption expenditures(PCE) was 2.98% and health care spending contributed 29% to that gain(.88%). Historically PCE is strongly correlated(.90) to the consumption of Goods and you could model PCE gains with a linear equation based solely on Goods consumption. From 2000 until the beginning of 2014, we can reasonably say that where Goods consumption goes, PCE will follow. Over this same period we find that health care is loosely correlated(.29) to PCE. In 2014 things changed and health care spending became the driving force of PCE. Here is a graph from the BEA site and you cannot help but notice that in 2014 the gains in PCE looks to be strongly correlated to health care spending and goods consumption is now loosely correlated. Considering how important health care spending has become to PCE and GDP gains and the weak Goods numbers reflected in the GDPNow forecast, if health care spending comes in weak or negative like it did in 2014 then we are going to see some really ugly GDP and PCE first quarter numbers. This entry was posted in Economy, GDP and tagged economy, GDP. Bookmark the permalink.